Team captain Akshar Patel at practice. The highest-ranked high school chess team in the state of Ohio is a middle school chess team in the city of Cleveland. They play for Joseph M. Gallagher, that brick, brutalist fortress on Franklin Boulevard at West 65th Street, a tee shot from the heart of Gordon Square. Established by the Cleveland Metropolitan School District in the mid-1970s and operating for years as a junior high school, Gallagher is now CMSD's largest PreK-8 school and counts itself among the district's several multilingual, vibrantly multicultural campuses. Gallagher, multiple teachers and administrators tell Scene, has "a family feel." If that's the case, the students on the chess team are making their family proud. The only problem is what to do about all the trophies. When the year's hardware is assembled in full, it's a glittering, golden skyline. But there are too many of them for a permanent display. And so teachers and staff, who've become die-hard fans of the team, have volunteered their classrooms and offices to accommodate. Several of the tallest trophies now reside with school psychologist Amy Such, who watches the chess team practice every day, after the 2:30 bell, from her library-adjacent office. Gallagher's recent success has been astonishing — neither Such nor any of her colleagues dispute the accuracy of the word "unprecedented" — in part because there are no prodigies on the team, no wunderkinds ranked above 2,000, the rarified air of U.S. Masters, or even in the mid-1,000s, the territory of competitive high school players. No one started playing at an early age, and no one has trained with elite coaches or highly paid chess tutors. 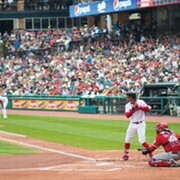 Eight of the team's 10 official members — and all of the players who competed regularly in 2018-2019 — are recent immigrants from India and Nepal. They've picked up chess only in the past two years and have devoted themselves as fully to their friendships with one another as they have to the game. That's how they've gotten so good. By playing each other. A lot. 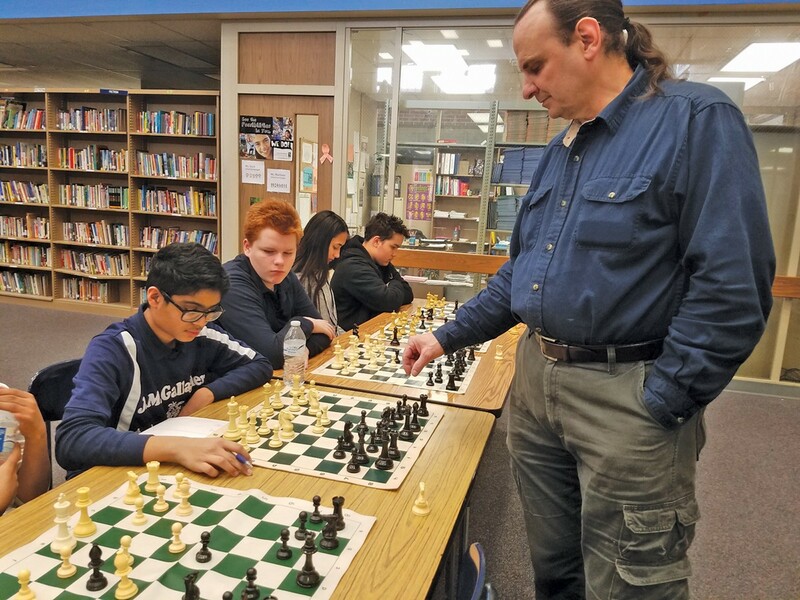 Gallagher eighth-grade language arts teacher Jose Colon, whose homeroom has become a kind of satellite headquarters for the team, at least during school hours, says that the chess players are the sort of students who turn in homework assignments days before they're due. "They turn in their in-class assignments early too," he says. "You know, so they can squeeze in a quick game of chess." Colon and other Gallagher teachers have high praise for the chess students, calling them "incredible," "bright," "dedicated," "positive," "committed," "responsible," "on-task," "enthusiastic." And their chess exploits? Those are "amazing," "fantastic," "unbelievable," "huge." In the classroom, in tournament play and in life, the students of the Gallagher chess squad prove over and over again that they are the Cleveland team we should all be rooting for. It's CMSD's spring break, and seven members of the Gallagher chess squad are at team captain Akshar Patel's apartment in West Park. They're playing chess — what else? — on three roll-up boards arrayed side by side on the living room carpet. All but one of the core players, bespectacled eighth-grader Nouh Shaikh, live here in West Park. But Nouh spent the night last night, he says. Nouh fires up a laptop to verify some team statistics. He's fact-checking head coach Amit Ghose, who's trying to summarize the team's staggering list of accomplishments this season. Here's one. Over the past two years, Gallagher has gone 57-0 in CMSD tournament play. This is a feat that Coach Ghose believes has never been equaled, or frankly even approached. He's been coaching chess at Gallagher for nearly a decade, but this year's team? "What this year's team is doing has never been done before," he says. "In chess, there are many draws [tie games]. To go 57-0? To not lose or draw even one time? This is a rare accomplishment." Ghose is a first-generation Indian American — a native of the state of Uttar Pradesh — and serves not only as the head chess coach but as a bilingual instructor at Gallagher, which has CMSD's highest percentage of Asian students (10.8 percent, as of 2017). Akshar Patel and his parents immigrated from India in 2015. Nouh arrived from India, by way of Oman, in 2017. "October 13," Nouh says. "At 6:13 a.m. It was a Friday." The rest are Nepali, and arrived in the United States from 2008 to 2013 as part of a U.N. resettlement program. Most of them had been living in refugee camps in Eastern Nepal after their families had been expelled from the Kingdom of Bhutan in the preceding decades. "These are children from very humble beginnings," Coach Ghose says in a later interview. "Every day, I remind them that they were lucky enough to make it to this great country, and they have to succeed, for their families and for themselves." In Cleveland, almost every immigrant student begins his or her studies at the Thomas Jefferson Newcomers Academy — "TJ," to CMSD vets. There, the English as a Second Language (ESL) instruction and cultural acclimation is much more intensive. Once language barriers have been sufficiently reduced, students fan out to other schools. Many find their way to Gallagher. Several years ago, Coach Ghose — whom his players call only "Mister" — noticed that the Indian and Nepali students were having a difficult time adjusting. They were loners, Ghose says, and not by choice. Some of this he attributed to the language barrier. But he also sensed that they weren't particularly interested in popular American sports, and that they were struggling to make friends. He began recruiting them for the chess team, hoping first and foremost to give them a social outlet. That this year's team has embraced chess as vigorously as they've embraced their friendships was unexpected. He gestures to the students, who are wrapped up in their conversations and their chess, erupting in laughter and their native languages after audacious moves. What some might see as extraordinary team chemistry Ghose sees as friendship strengthened by cultural bonds. They all take the RTA Red Line to school every day and meet on weekends at their homes or at Michael Zone Rec Center to practice chess and hang out. They share cultural festivals and food — many of them, under the watchful eye of their parents, are learning to cook regional cuisine. The girls are dancers. On Fridays at Gallagher, the students sit together at lunch and share meals from their home countries. "It's not just chess," says Coach Ghose. "Yesterday, there was a get-together. They played an hour or two of chess. Then they had a food party and watched a Bollywood movie." Akshar's mom has prepared poha — a spicy flattened rice — and chai tea, and Nouh, much to his teammates' chagrin, tracks down a YouTube video of a dance performance at Gallagher from a couple years back. The girls are mortified. "I also have another skill," says Nouh, revealing a Rubik's Cube. "Nouh can do it in less than two minutes," Coach Ghose brags. "It's been a year since I've done this," Nouh reports. "You literally did it yesterday," says eighth grader Oma Dahal, from across the room. "Yes," Nouh admits. "But it's been a year since my top skills." He completes it in 105 seconds. 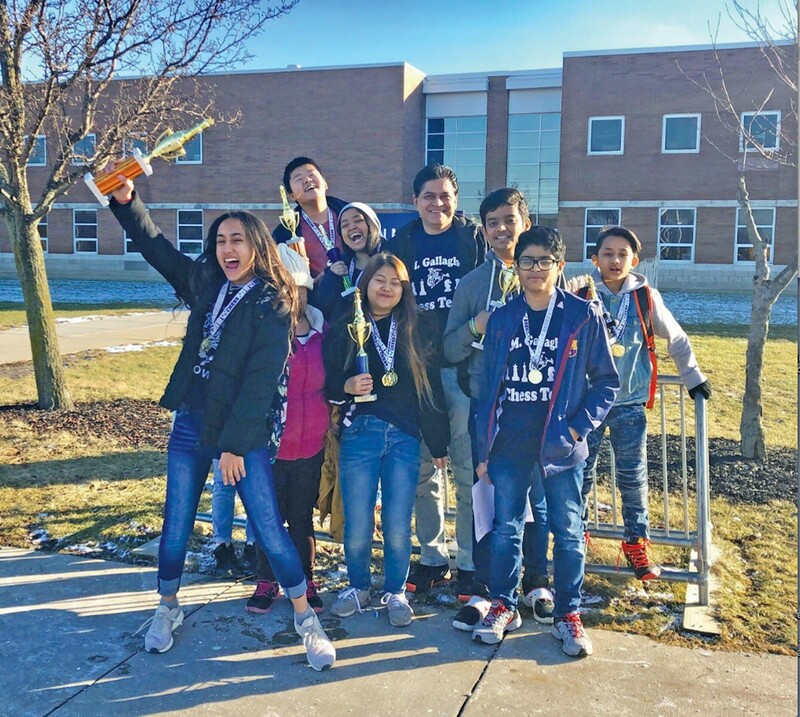 The fact that the Gallagher chess squad is led by mostly eighth graders who have been playing competitively for two full seasons has bolstered their confidence and their performance. The players now say sincerely that their practices are much more difficult than tournament play. Every day at the Gallagher library after school, they play each other in rapid succession. After one game is complete, they immediately begin again or else challenge another player. Their faces are low to the roll-up boards, their moves decisive. Eighth-grader Oma Dahal is known to be the team's most deliberate player. Eighth-grader Arpan Rai, his teammates say, plays fastest. The squad's nuclear-grade secret weapon, though, is seventh-grader Sunita Magar, a soft-spoken Nepali whose ferocity on the board is belied by her smiling shyness. Before games she sometimes appears to be daydreaming, and during games she'll lazily cup her face in her hands. But her focus is razor-sharp, her attacks merciless. Even as she has rapidly improved this year, she's still lovingly known on the team for her tardiness. "When I was 8 or 9 years old, I wanted to be a doctor," Sunita tells Scene, when asked what she wants to be when she grows up. "Where I came from there weren't many doctors. But now, I know that I can't, because of my abilities." What were her abilities? Scene wanted to know. "My abilities are: I love to sleep." Coach Ghose refers to Sunita as the best middle-school girl in the state of Ohio in her division. "She knows now that to get better, she needs to play against players who are stronger than her," he says. "All the girls. They used to only want to play their friends. Now, they'll play anyone. They are fearless." Sunita is one of four girls on the Gallagher team this year, alongside Oma Dahal, Binita Biswa and Ritu Limbu. This means that among regular competitors, there's an even split along gender lines. This is exceedingly rare. Though competitions are mixed, chess is dominated by boys. Ghose says Gallagher's principal Thomas Kubiak specifically asked him to recruit more girls for the team this year. "Boys are more aggressive," Oma tells Scene. "But honestly, I'm more intimidated playing other girls. The girls are so rare that you know they are very smart. They are slower, more mature. The boys make many mistakes, and you can take advantage of them." The team's top two players (by official rating) are Akshar and Nouh. They've both gotten so good so quickly that they've advanced out of the main middle-school pool and now compete in the "Champions" bracket, reserved for players ranked above 1,000. It's the equivalent of welterweight boxers gaining 60 pounds and extending their reach by several inches, all while maintaining their foot speed, and all in the span of a few months. Akshar and Nouh's ascent has been both exhilarating and challenging for the team, because team chess scores are based on the cumulative point total of a team's top four players in each round. A player receives one point for a victory, a half-point for a draw, and zero for a loss. Without Akshar and Nouh, Gallagher's dominance was less assured. With Akshar and Nouh, Gallagher's dominance was unequivocal. Having dispatched their CMSD counterparts, Gallagher competed this year in the Greater Cleveland Scholastic League. These monthly tournaments, organized by the local chess nonprofit Progress with Chess, convened some of the region's stiffest youth competitors. "These are farm programs, more or less," Coach Ghose tells Scene. "Regional powerhouses. The kids start playing at 5 or 6 years old, and the top players from the middle schools then play on their high-school teams." 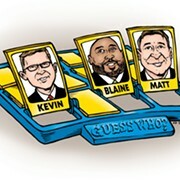 Ghose lists off some of their well-heeled opponents: Beachwood, Solon, Hawken, Westlake, etc. But none of these programs were prepared for what awaited them in Gallagher. In November, during the first of the GCSL tourneys, Gallagher edged Solon by half a point for the top position. Coach Ghose was floored. "We thought it was a fluke," he says. But then the team won again in December, and momentum was suddenly on their side. Then they won the next tournament, in February. Then they won in March. "These victories," says Coach Ghose modestly, "were in convincing fashion." 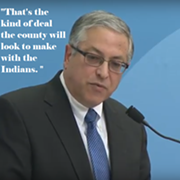 By now, CMSD was taking notice, in part due to Ghose's relentless advocacy and publicity. CEO Eric Gordon himself sent personalized letters to the team, congratulating them on their regional accomplishments. Students at Gallagher, too, were beginning to notice their classmates. "They are becoming a little bit like celebrities," Ghose says. "Students have their favorite players. And they all want to join the team now." In a stroke of good fortune, a rated chess master named Steven Seward lived down the street from Gallagher and volunteered his services. Seward tells Scene he heard about the team in a block club email, and as a former Ohio Speed Chess champion, he reached out to Coach Ghose, who accepted immediately. "Mr. Seward is ranked above 2,000," Ghose says. "Two-thousand two-hunded and seven, I think," says Akshar. Seward, who has come in after school to play simultaneous games with the team and offer tactical tips, says he was surprised by the students' skill. "As far as I can tell, they've had no formal training," he tells Scene. "Most chess players I know have at least studied books. Others have had expert players teaching them. I don't know where they got their chess from — of course it's different nowadays, with the internet — but they've gotten to an impressive level all on their own." Akshar, who is regarded as the strongest player on the team, says he regularly watches full games on YouTube to study the openings of the world's best players. Seventh-grader Reyosh Biswakarma swears by the Chess Talk YouTube channel, where he says he's learned a variety of ways to checkmate opponents. Nouh enjoys the "Play Magnus" app on his phone, where you can play against a simulated version of world champion Magnus Carlsen at his various stages of development. But nothing teaches chess like playing chess. And Seward has been valuable to the team's top players in the same way that the team's top players have been valuable to those developing their skills. 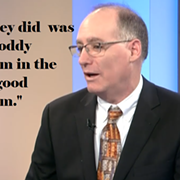 "Akshar, for example, became obsessed with beating Mr. Seward," says Ghose. "I beat him yesterday," Akshar says. "Twice." 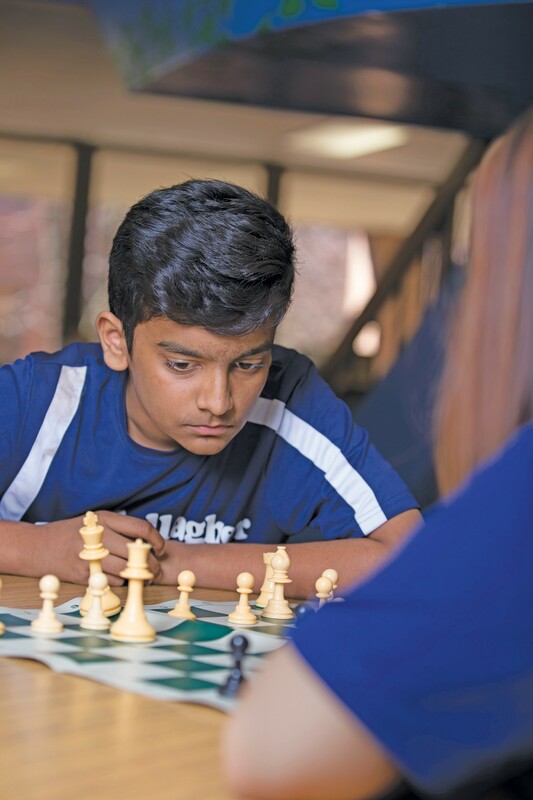 As the GCSL victories mounted, Gallagher teacher Cynthia McGuire, who taught many of the chess students as fifth graders, urged Ghose to take the team to nationals. They were good enough. They deserved to compete against schools from around the country. Principal Kubiak agreed. The students deserved an experience. But the district's funds were limited, and the U.S. Chess Federation's national middle-school championship was to be held in Texas. The trip was much too far and much too costly for the team, even with growing community support. Local chess master Steven Seward plays simultaneous games with the team,but Nouh Shaikh is a worthy challenger. The national high-school championship, however, was to be held in Schaumburg, Illinois, an hour outside of Chicago. Illinois was much closer, much more doable. And even though Ghose worried about the vulnerability of his 13- and 14-year-olds squaring off against seasoned high-school teams in the pressure-cooker atmosphere of national tournament play, the kids had earned the opportunity. Gallagher held a pep rally for the team in March. Each player was introduced as their accomplishments were read over the deafening applause of their classmates. They stood before the school on the squares of an enormous home-made chess board, donned in their trademark navy-blue-and-white jerseys. And on Thursday, March 14, the players awoke early. They met at Gallagher before the sun came up, boarded a van and headed West. It is a matter of perpetual controversy at Joseph M. Gallagher that Amit Ghose, the head chess coach himself, believes that Michael Jordan is the greatest basketball player of all time. "LeBron is the greatest player of his generation," Ghose concedes to Scene, when asked to defend his position against the obvious. "But there is a reason why LeBron wears Michael's number. During championship time, it is the elevation of the game. LeBron is not a natural-born assassin like Michael was. If you have three seconds on the clock, would you rather give the ball to LeBron or Michael? Ask anyone. They give it to Michael. LeBron is a master distributor, a facilitator. But Michael, as a competitor, was the total package. He never had a bad game, even with the flu." Ghose frequently turns to Michael Jordan analogies when describing the Gallagher chess team. Just like Jordan, he says, the practices are more intense than the games. Just like Jordan, he says, there is a healthy amount of trash-talking. And just like Jordan, he says, when a flu bug visited the team in Schaumburg, they dug deep and played through it. Ghose was scrambling for Tylenol that Friday evening after the tournament's tough opening rounds. The following day, he knew, was going to be hellish. Chess tournaments are excruciatingly long. A round is only completed after every game is over. So if you win or lose early, you've got a lot of downtime. At the district level, each round is two hours, but at nationals, each round is five. Three rounds were scheduled for Saturday, and his players' temperatures were rising. The illnesses would have been easier to keep in check had they booked rooms at the convention center hotel, where the tournament was held. Ghose had been looking for value, though, and the team was camped out in a hotel 15 minutes away. On Saturday, as other players returned to their rooms upstairs to nap or unwind after games, the Gallagher kids were stranded, nursing headaches in the hallways. The U.S. Chess Federation, at the high-school level, has a U-800 division (players ranked below 800), and a U-1,200 division. This put both Sunita Magar and Binita Biswa up with Nouh and Akshar, above the level where they normally compete. That meant that Oma Dahal would be anchoring the foursome in the U-800 division, along with teammates Arpan Rai, Ritu Limbu and Reyosh Biswakarma, the leather-jacket-wearing team rebel. While players are matched against competitors of the same general skill level, playing against high schoolers is still a different beast. They're physically imposing, for one thing, but they also play more assuredly. They make fewer mistakes. Chess, by its nature, is a cruel and unforgiving game — it is not uncommon for students to emerge from tournament ballrooms in tears — but high-school players are more experienced, keener to exploit their psychological advantages. The Gallagher kids didn't have to look at the ratings to be intimidated. The high-schoolers they were playing were huge. Nevertheless, and in the face of their sickness, the team prevailed. Both Nouh and Akshar managed to tally 4.5 and 4 points, respectively, over seven rounds in the U-1,200 group. But the star of the tournament was Reyosh. He'd lost his first two games Friday, and things were looking bleak for the U-800 squad heading into Saturday. But in Round 3 Reyosh was pitted against a player who had also lost his first two games, and Reyosh defeated him. He then won his fourth round game, too, bringing his individual record to 2-2. In Saturday's final round, he won again. The U-800 team was making some noise. Oma, Arpan and Ritu were collecting victories as well. Reyosh won Sunday morning, bringing his tournament record to 4-2 (four total points) with one round to go. In the final round, he was matched up against a player from Florida who was also 4-2. "He was playing with white," Reyosh tells Scene, "and he told me that the only two games he'd lost were when he was black. 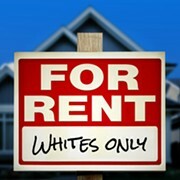 When he was white, he said he had destroyed his opponents." Reyosh's heart was racing, he says, but even with the slight disadvantage of playing with black (which moves second), Reyosh took the game. At the Ohio Middle School Championships, three weeks after Schaumburg, the Gallagher team wants to put the only cap on their season that makes sense: a state title. They're feeling confident and relaxed at the Hilton Garden Inn in Mayfield Village as match assignments for Round 2 have just been posted. They process into the hotel ballroom and take their seats, writing their opponents' names in paper booklets — players are required to record their moves so that if a dispute arises, neutral judges can check the results against both players' tallies. No parents or coaches are allowed in the playing area once the round begins, and so Coach Ghose, at tables near the hotel bar, can do little but wait. As he has before, Ghose mentions that he's hopeful the team might be able to stay together next year, even as the majority of them head to high school. Most of the students live near John Marshall and have expressed interest in the three schools on CMSD's campus there. But Binita, whose expressiveness and buoyant personality seem suited for high-school theater, and Oma, who loves to dance, have both also considered the Cleveland School of the Arts. Ghose wants nothing but good things for this team and hopes that all the kids find their way to high schools where they can thrive. But if the team does manage to stay together, he intends to stay on as coach and mentor. What has made the Gallagher team so successful this year is that they have all improved. Together. Akshar, Nouh and Sunita may be individually dominant, but every player has shone brightly in district and regional tournaments. Each one of them has scored crucial victories when others were outmatched. A single stellar player cannot carry a squad. There's no "I" in team just as there's no "I" in chess. That's why, if they go to different high schools, Ghose says, even if they continue to succeed, they won't be able to reproduce the power of the team. This team. "We don't know what will happen in high school," Ghose says, "but this year, these moments, they are something we may never experience again. This team has been so special. When they come together, magical things happen." Ten minutes after Round 2 begins, Reyosh emerges from the ballroom with a smile. Not satisfied with his rapid victory, though, he immediately tracks down Roy-Allen Bumpers, a coach and organizer with Progress with Chess, and challenges him to a game. Arpan Rai comes next, moping over to Coach Ghose and then flashing a smile as Ghose begins to console him: Tricked him good! Next out of the room is novice player Joshua Hargett, whom Ghose congratulates for taking his match to a draw. Nouh is a few moments behind, striding over to the Gallagher tables having claimed a victory in the Champions pool after an intense first-round loss. Binita and Oma are still in there, as is Akshar, who's being extra careful after losing his first round game to a player rated in the 1,800s. Sunita slips out of the ballroom after Nouh, almost unnoticed, but shoots a thumbs-up to her teammates. They don't know yet that she is in the midst of one of the state middle-school tournament's most impressive individual performances of all time. Sunita will go undefeated in six rounds. And in every round, she will beat a player who had been undefeated until they played her. She is the conqueror of conquerors. It should go without saying that Gallagher will take home the state title. In Sunita, Oma (who will have no losses and two draws) and Arpan (who will lose only once), Gallagher will boast the division's top three individual performers. Ritu will be ranked seventh, Reyosh 15th, in a divisional pool of 71 players. Sunita scans the table, looking for an opponent. They have all just finished high-stress tournament games, yet there is no repose — no scrolling through cell phones or trawling for snacks. They can think only of diving back into chess. "Nouh," she calls, and Nouh turns, giddily. "Wanna play?"